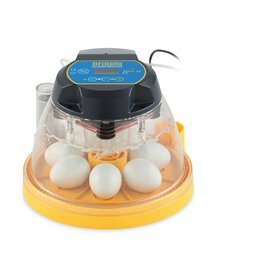 This new incubator model, Brinsea's Mini II Ex, holds 7 hens’ eggs. The new series has the same great features as the first Brinseas, with some added convenience. This top-of-the-line model is the most convenient of all of the small Brinseas because everything is automated. 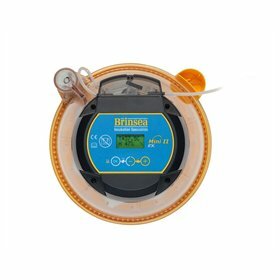 Precise electronic temperature control with alarms, circulating air to keep the temperature even throughout the chamber, automatic egg turning, integrated peristaltic water metering pump for automatic humidity control. The water pump humidity control system comes partly assembled (you must hook up a tube; instructions with illustrations are provided). You must also provide a water container, such as a water bottle, as a source for your humidity pump. And your fertile eggs! The factory temperature is preset at 99.5 F but it is adjustable. There is a digital temperature indicator but you will also be provided with a conventional glass thermometer to double check your incubator's temperature. 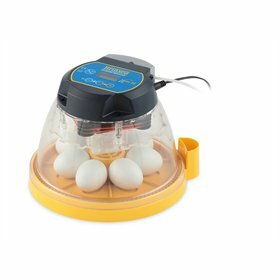 The Brinsea Mini II Ex incubator measures approximately 10" round and 8" tall and weighs 3 lbs. 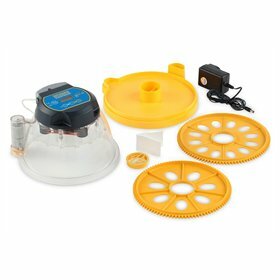 For this model with automatic humidity control, you'll also need space to set your water container on the same flat surface, so it can be hooked to the pump. The water container cannot be placed on top of the incubator. 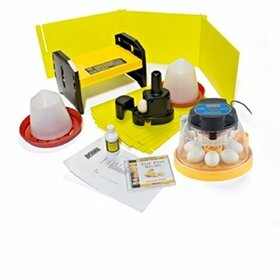 Your purchase comes standard with four discs, for use with up to seven hen or duck eggs and approximately 12 quail or pheasant eggs (largest egg size recommended is ducks). 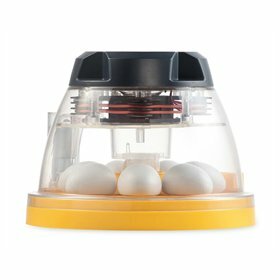 If you're looking for a lower priced incubator with fewer automated features, please check out the Mini II Eco and the Mini II Advance. You might also enjoy the Mini II Advance Classroom Pack.